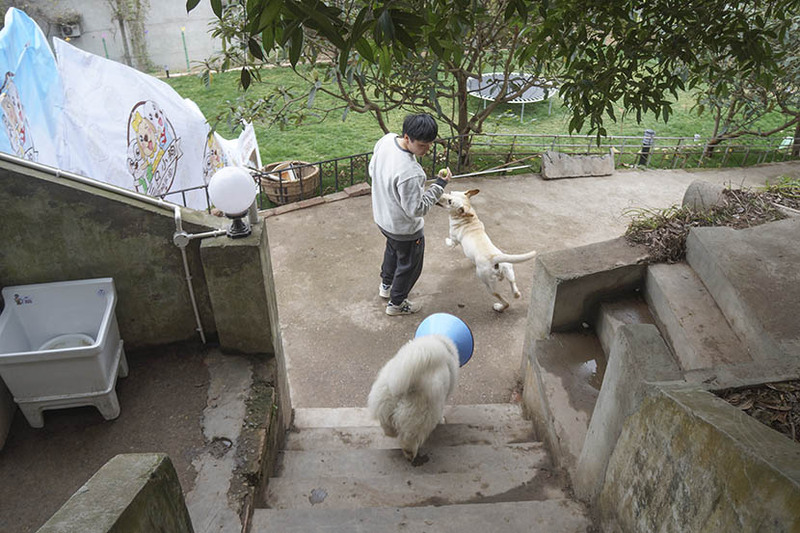 SICHUAN, Southwest China — When Li Xiaolu adopted two puppies last summer, she worried about how to train them, where to buy them the right food, and whether the two would get along. What she didn’t worry about was how badly they would be affected by smog. Chengdu, capital of Sichuan province, is often described as the home not only of giant pandas, but also of some of the happiest people in China: Chengdu residents are known for their relaxed and slow-paced lifestyle. But recently, a decline in air quality has had the city’s 14 million people feeling worried and anxious. The smog this winter was so heavy that at one point, the runway of Chengdu’s international airport had to be closed. “I saw the haze in the air, and it felt like the sky was falling down,” the 22-year-old Li recalled, describing the view from her window on a return flight from the southern city of Guangzhou. When her dogs started to cough last November, Li didn’t associate it with the air pollution right away. “At first, I thought Bu Yao had food stuck in her throat, as she’s so tiny, so I held her upright and shook her,” says Li, who moved to Chengdu in 2010 to study nursing. In December, when other dog owners in the neighborhood began talking about both them and their dogs coughing a lot, they started to suspect that it was due to the air pollution. Li started to worry about the health of her Bernese mountain dog, Bu Dong, and her toy poodle, Bu Yao — whose names translate to “don’t know” and “don’t want,” respectively. She says she named them after her life philosophy of being content with what she has and not desiring too much. Throughout early March, official figures put Chengdu’s air quality index (AQI) at around 110, or “unhealthy for sensitive groups,” including the very old, very young, and immunocompromised. “But dogs, especially big ones, need to be walked so they can release some of their energy,” Li says. When she takes her dogs for a walk, Li makes Bu Dong wear a muzzle and a snout mask. Masks made for humans don’t fit the 34-kilogram dog, so she puts wet tissues inside the muzzle and covers it with a piece of cloth on the outside. “Bu Dong doesn’t like it, but it’s for her own good,” Li says. Bu Yao, however, has to make do without one, as the toy poodle isn’t even big enough to climb onto the sofa yet, and is far too small for smog masks. When the tiny poodle coughs, Li puts holds her in her lap and pats her back. “They mean the world to me,” Li says of her canine companions. This winter, the unusually heavy smog has kept Chengdu’s veterinary clinics busy. Huang Li, a vet with over a decade of experience, tells Sixth Tone that since the new hospital she works at opened last November, she has treated coughing dogs every day. “I had never seen this at the clinics I worked at in previous years,” she says. Although there are no official figures or research on how China’s pets are affected by air pollution, several vets told Sixth Tone that the health implications are similar to those in humans. “Since dogs and human beings share a similar physical structure, smog that harms humans also damages the lungs of dogs,” says Huang. Several vets in Chengdu also confirmed an increase in coughing and sneezing in dogs, which coincided with periods of heavy air pollution this winter. Huang explains that larger particles that are obstructed and filtered by the human nose can have adverse effects on dogs, as their nasal hairs are too short and sparse to protect them from dust and larger particles. Furthermore, dogs breathe at a faster rate than humans, and because they are closer to the ground, they’re more susceptible to breathing in particles that can be absorbed by their lungs to cause coughing and sneezing, and then enter their bloodstream to cause a variety of conditions, from retinal disease to fevers. In some cases, air pollution can even cause life-threatening diseases like lung cancer. Air pollution has a greater impact on puppies, older dogs, and dogs with weaker immune systems — “in much the same way that children and the elderly are more vulnerable to air pollution,” Huang says. Huang feels that there’s little she can do to comfort pet owners. In severe cases, she prescribes antitussive drugs to relieve coughing. Generally, though, she just advises them to avoid long walks. Following the dog doctor’s orders, Li now walks Bu Yao and Bu Dong for very short periods of time — about 15 minutes in the morning, and then again during lunch. In the evenings, when the AQI is usually higher, she rarely takes them outdoors. “When you see the data climb to over 300, you don’t want to go out anyway,” she says. While many dog owners are using face masks to protect themselves from air pollution, similar masks for dogs currently don’t exist. “The market may not be large, but someone has to take the risk eventually,” says Mary Peng, CEO and founder of Beijing-based International Center for Veterinary Services, an animal hospital and pet care facility. Peng says she’s been looking for dog masks for years but has only come across homemade products from particularly concerned pet owners. “Necessity is the mother of invention,” says Peng, who owns four cats and one dog herself. Last year, Peng approached Cambridge Mask, a U.K.-based pollution mask manufacturer, and asked whether they would be interested in producing masks for dogs. “I planted this idea in their head, and now it’s sprouting,” she says. Cambridge Mask CEO and founder Christopher Dobbing told Sixth Tone that his company has already started working on the new line of masks specifically for dogs. According to estimates, more than 1 million pets — the majority of them dogs — live in Chengdu, and Li is not the only one who is worried about their health. The only truly viable option appears to be escaping the bad air — something entrepreneur Fang Ling is trying to turn into a business, in the form of a pet hotel in the mountains outside Chengdu, where the air is fresh and clean. Last year, Fang bought an apartment in the city center with the needs of her young Labrador in mind. She chose one with a big balcony, which would allow her dog, Jian Jian, to enjoy sunshine and fresh air. In the winter, however, air pollution levels were so bad that Fang and Jian Jian spent all their time indoors, never far from their air purifiers. “He looked sad,” Fang says of Jian Jian. Late last year, the 35-year-old took a drastic step: She sold her apartment, moved 30 kilometers east of the city center, and opened a dog hotel where owners can drop their dogs off while they are away on holiday. Key to choosing the right location, she says, was finding a place where the air quality was fairly good. As a former marketing director, Fang is adept at promoting her hotel on social media, and although she only opened it in January, more than 50 dogs have already stayed with her. Most of them come from the city. Business is going well, and Fang is currently expanding the facilities and adding a pool where her canine guests can swim.